In this post we look at the man who among them comes closest to the definition of an “old-style hero” and yet who, in his own ways, is as flawed and full of doubts as any of them. Lothar “Blade” Petros is an AdventureSport warrior. Voted Prime League Player of the Year on a record seven occasions and Prime League Warrior of the Year for a record ten straight years, winner of five Prime League team titles, and the winner of ESB Sports Personality of the Year three times, he is perhaps the greatest AdventureSport player the game has ever seen. Blade was raised for the game from an early age; his father had been a player himself, but having achieved only a moderately successful career saw his son as a project through which he could achieve proxy success. In that, cold, abusive, and bitter as his father was, the older man achieved clear success. Starting as a junior warrior in a second-tier team, the then Lothar quickly proved that he was more than just his father’s son, his prowess with the sword leaving a trail of shattered magically-animated constructs in his wake and earning him the moniker, “Blade”, that would follow him through his career. Commentators, journalists, and other astute followers of the game often said of Blade that it wasn’t his combat skills, impressive though they were, that had turned him into an arena legend. He was a master swordsman, that much was true. But there were others who were equally adept with either weapon or fist. Nor was it, they said, his strength or his size or his agility that marked his greatness. He did indeed have an imposing frame that combined great strength with incredible agility, but there were many near-superhuman athletes in the arena, of whom he was just one. No, what set Blade apart, the astute observers said, what marked him out as perhaps the greatest AdventureSportsman who’d ever lived, was his speed, and not simply the speed of his body, nor even his reactions, but the speed of his thoughts. Blade could think faster than perhaps any man alive, could think faster than might ever seem possible, could think so fast that it sometimes seemed as though he was bending either time or space, such was his ability to begin his evasion of an attack before it had even been launched, and to launch his counter-attack only instants later. Thinking at the speed of instinct, fired by reactive patterns formed by thousands of hours of practice, Blade was already diving into a roll as the longbolts fired, evading the beams, and moving so fast that he was upon the three troops before they had even the merest chance to respond. Blade checked his wrist-dial. Quido was late, as he’d already been when Blade had last checked the time some five minutes earlier. Hanging around the locker room like this made him very nervous. Anyone might enter, at any time. What would they think? One of the most famous AdventureSport warriors of all time hanging around the changing rooms of a dodgy back-street gym? If he was lucky, then maybe they’d figure he was hoping to indulge in what the news-slates still euphemistically termed “Elvish practices”. Or if he was unlucky they might just guess the truth. 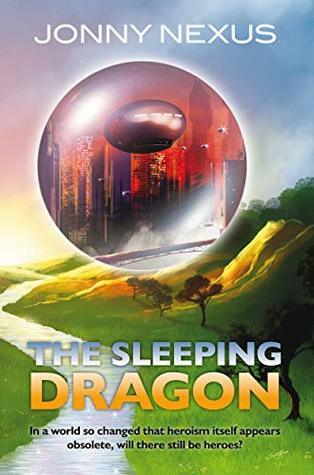 The events of Sleeping Dragon offer Blade a chance for redemption. He brings to the team not only his obvious physical abilities, but also an old-fashioned blend of courage, determination, and principled leadership. People didn’t understand. The sight of him wielding a sword with the elegance that had bought him a name as well as fame made them assume combat was his joy in life. They were wrong. He loved the game, but it was the challenge that was his love, the thrill of setting himself against unfavourable odds and the exultation of then winning through. No one ever seemed to understand: not his father; not the various idiots in bars who over the years had challenged him to “go outside”; and not Toozie, who’d loved him then left when he chose the game over her. He’d been an idiot for letting her go. What did it matter if she hadn’t understood what the game meant to him? She’d understood that he’d let it mean more to him than she did, and at day’s end that was pretty much all that counted. He could now have taken the anger this realisation always aroused and channelled it into a confrontation. But he slapped that thought down. He wasn’t his father, and he never would be. This was just another idiot in a bar. Granted, he’d never faced an orc idiot before, nor one who appeared to be wearing a vomit sporran. But this was just a bar, and the orc was just a guy, even if he was the size of a two-seat brick outhouse with a smell to match. As the events of the story progress, Blade’s companions quickly realise that if you’re facing trouble, with a bunch of strife heading your way, Blade is a man you’ll want standing by your side.